In July 2014, we conducted a survey of Pompeii’s street network to document traces of iron that were observed on the stone-paved streets, which resulted in the identification of 434 instances of solid iron and iron staining among the paving stones. This paper describes the iron deposits, categorizing them into six observable types, and argues that, in the final days and weeks before the eruption of Mount Vesuvius in 79 C.E., Pompeians were—in addition to using solid iron wedges—pouring molten iron and iron slag onto their streets as a method of emergency repair. Before discussing the evidence available for how the melting, transporting, and depositing of these ferric materials might have been accomplished, we address whether the Romans had the technical ability to achieve sufficiently high temperatures to melt iron, finding much evidence to affirm the claim that they did. 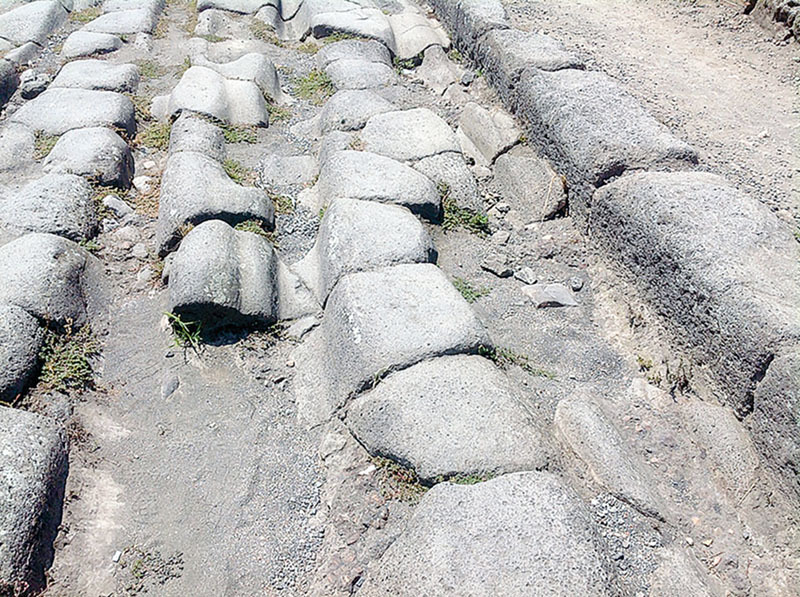 Finally, we consider why Pompeians undertook such measures to repair their streets. Recent research on the costs of paving stone streets in terms of time, money, and opportunity provides the economic context for this novel repair process and shows the use of iron and iron slag to have been an expedient alternative.